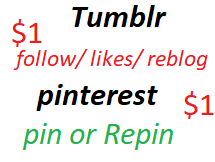 i will give you Follow or Reblog or Likes . i will manually create board for your website and i will pin or Repin them with some individual account..
Dear sir please try my service for first test i think you will be satisfied ..
. All service have extra in bellow . 110+ Tumblr notes or 200+Pin or Repin share is ranked 5 out of 5. Based on 20 user reviews.